If you have applied for J&K Bank Recruitment announced in Oct, 2018,then we have something very important for you. You might already be aware that J&K Bank has Postponed and Re-Schedules its Online Exams for PO and Clerk Posts. At First, Exams were scheduled to be held in the Feb, then due to some administrative reasons, these were postponed to April. 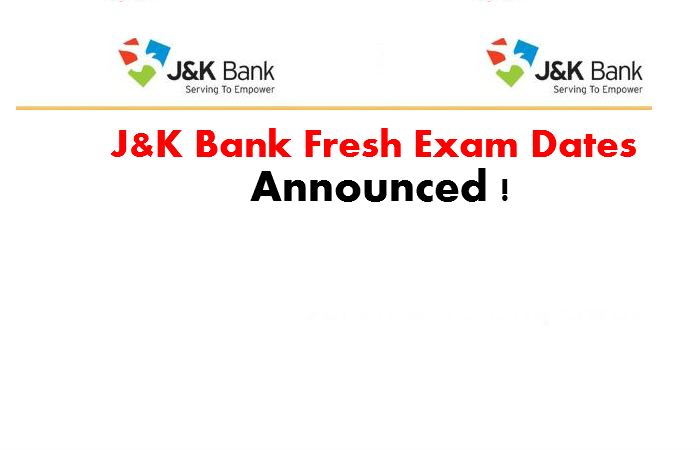 and Then on 28th March, 2019, J&K Bank, made some minor changes in the Schedule of Exams. Actually, there is Election on 23rd April in various parts of the state and as such J&K Bank decides to conduct the exams on 22nd and 24th to 26th April, 2019. Here is the Exact Schedule of J&K Bank Online Exams. 2) Banking Associates : 24th April to 26th April, 2019. So, there are the Final Dates as per the J&K Bank Official Notification. Now the Dates are announced and Next thing, you would like to know is the Venue and Date of Exam and this thing will be known only after your Download the Admit Cards. 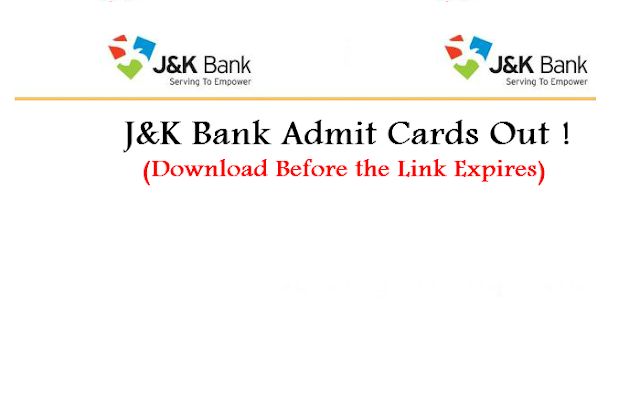 In this post, we will discuss with your the step by step process for Downloading the J&K Bank Admit Cards 2019. Applicants should note that previous Admit Cards that you have downloaded in Feb, 2019 stands cancelled and you are required to download these Fresh Admit Cards. If you are looking for Teaching Jobs in J&K, then Jobs in Government Schools is not the only option. Though Education Department of J&K is biggest creator of vacancies, yet it does recruit each and every Teacher Aspirant and this is the reason, you have to Explore Teaching Job Opportunities in other sectors too. Talking about Teaching Jobs, outside the State Govt School, we have good no. of vacancies in KV's, NV,s , BSF Schools, Army Schools, Sainik Schools, and various other Public Schools. Notifications for these schools are issued time to time in Local Newspapers. Have you Heard of Jobs in J&K Police Public School? and Today's post will have Notifications for various posts in J&K Police Public School and that too on Urgent basis. In this post, we will discuss about Recruitment for various posts in JK Police Public School, Miran Sahib. 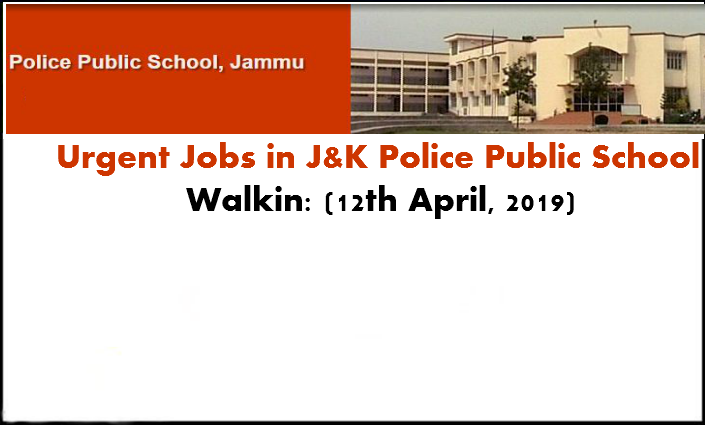 Applicants willing to apply for Jobs in J&K Police Public School, Miran Sahib, should read this post till the end and also submit their application form before the closing Date. If you are reading this page, then chances are you have applied for JKBOSE Jr. Assistant Recruitment 2019 for 84 Posts and if you have not applied, then it might be possible, that you don't possess the Eligibility Criteria. Jr. Assistant is the only post that JKBOSE has advertised in the Last 10 Years. Last Time, JKBOSE announced the Jr. Assistant Jobs in 2013 and It is after Six years, that we have another JKBOSE Jr. Assistant Recruitment. In this post, we will discuss in detail the Topic wise Syllabus for JKBOSE Jr. Assistant Exam 2019. If you have applied for Junior Assistant posts in J&K Board must read this post till the end, and download the Syllabus. In our Future posts, we will also share the Previous Papers and Study Material for Upcoming JKBOSE Jr. Assistant Exam. 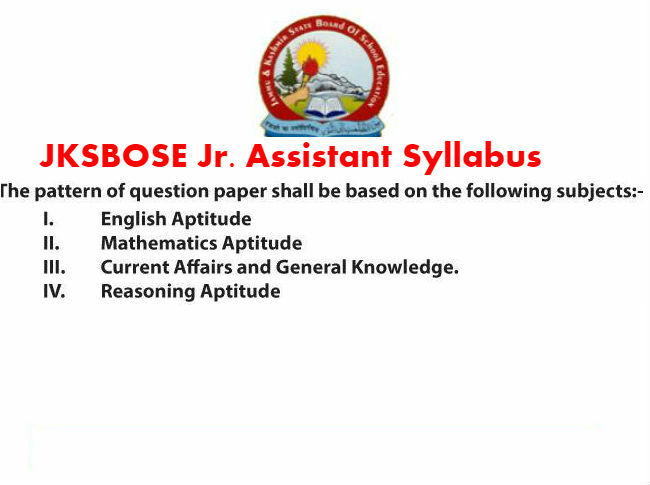 If you have applied for Jr. Assistant Posts in JKBOSE, then this post need your attention. The much awaited Written Test Dates for JKBOSE Jr. Assistant Exams have been announced. It is pertinent to mention here that JKBOSE has announced the Recruitment for 84 Jr. Assistant Posts in the First Week of Jan, 2019 and this Advertisement, receives a massive response from candidates. It is expected that more than 50,000 candidates have applied for these posts. So, we can expect a Cut throat Competition in the JKBOSE Jr. Assistant Recruitment. Owing to Large number of candidates applying for these posts, JK Board has made some Changes in the Selection Process. Earlier the Selection Process comprises of Shortlisting the candidates for Type Test (Those who Qualify Stage -I ie Written Exam with 50% Marks) has become InEvitable and Now the Board has decided to Shortlist the candidates in the Ratio of 1: 30 of those who Qualify the Written Exam with 50% Marks ie which simply means that this time, More candidates will appear for Type Test. It is estimated that more than 2500 candidates will be Shortlisted for Type Test. The Shortlisting will be done category wise. JKBOSE has already released the Jr. Assistant Syllabus for Written Exam and Good news is that, Syllabus is same as we have for most of the common competitive Exams.So, you won't find much difficulty with the JKBOSE JR. Assistant Syllabus. 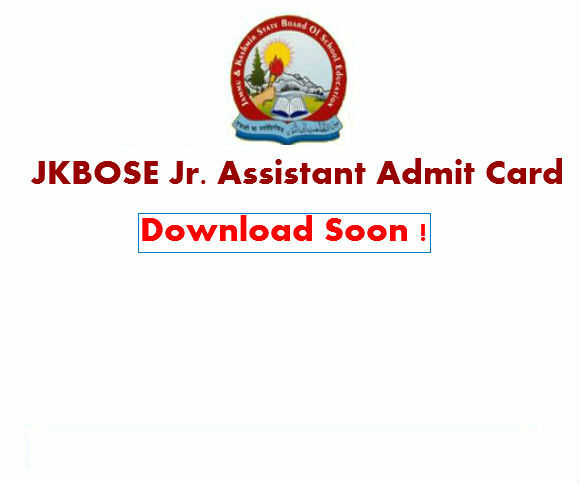 Now, Lets discuss about the JKBOSE Jr. Assistant Admit Card as without having the Admit Card, you won't be able to appear for the exam. In this post, we will discuss the step by step process for obtaining the Admit Card for JKBOSE Jr. Assistant Exam. If you have applied for Jammu and Kahsmir Recruitment for PO and Banking Associate posts, you might be aware that the Bank has postponed the Exams starting from 21st Feb, 2019 and the Good News is that New Exam Dates have been announced and you have got some more preparation time, as Exams are scheduled to start from 3rd Week of April, 2019. It is pertinent to mention here that J&K Bank has announced the Recruitment for 1200 Banking Associates and 250 Probationary Officers Posts in the month of Oct, 2018 and Online Registrations continued till 30th Nov, 2018. In this post, we will discuss the Updated and New Schedule of J&K Bank Online Exams for PO and Banking Associates Posts. Applicants who have applied for these posts must read this post till end and also share their comments in the comments section below. If we talk about Government Jobs, then Teaching Jobs is the favorite and most sought after among Unemployed Graduates of J&K and there is a reason for this, as Education Department of the state is the Biggest creator of Jobs in Government Sector be it School Education Or Higher Education Department. 2013 was the Big year, as more than 5000 Posts were Advertised in Education Department, then in 2017, 3450 Posts were announced. It does includes posts of 10+2 Lecturers and Assistant Professors. More recently Government of Jammu and Kashmir, has upgraded many schools, and this will in turn create more posts in the Department. 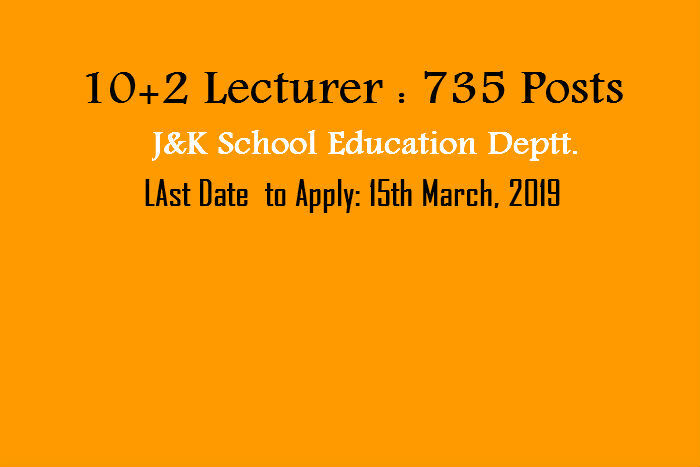 In our previous post, we have discussed the Detailed Notification regarding the creation of 4000+ Posts in the Education Department, if you have missed it, you can read it by checking this post on J&K Education Department Recruitment 2019, where you will find details on various jobs created in Eductaion Department. If you are the one, who is looking for Teaching Jobs in Jammu and Kashmir, then we have some awesome news for you. It's not the news from JKSSB and JKPSC, infact i suggest you to Forget Teaching Jobs in JKSSB and JKPSC and instead looking for other Teaching options available in the state. Other than the J&K Education Department Recruitment, there are various options for Teaching Job Aspirants. These Days, you can apply for Army Schools, Kendriya Vidyalaya, Navodaya Vidyalaya, BSF School, Sainik School, Air Force School etc. So, there is no dearth of Teaching opportunities in J&K. Moreover the Salary of these schools, is very much in line with the State Government Schools. Moreover the Recruitment Process undertaken by JKSSB and JKPSC for Teaching posts, is time consuming , On the other end, Selection process for these Central Schools, is Quick and comprises of mostly Interviews. Only Drawback of Jobs in these Schools, is that these are on Adhoc basis (Contractual and Contract peiod last for 1 year or Till the Regular appointment is made. But still its much better than the Teaching Jobs in Private Schools, where Salary is quite less. Today, in this post, we will discuss the Latest Teaching Jobs announced in the Army Public School Sunjwan and BSF Primary School, Paloura. If you are willing to apply for these Jobs, then you should read this post till the end and apply with in the prescribed dates for submitting the Application form. Army Public School Sunjwan Recruitment 2019. 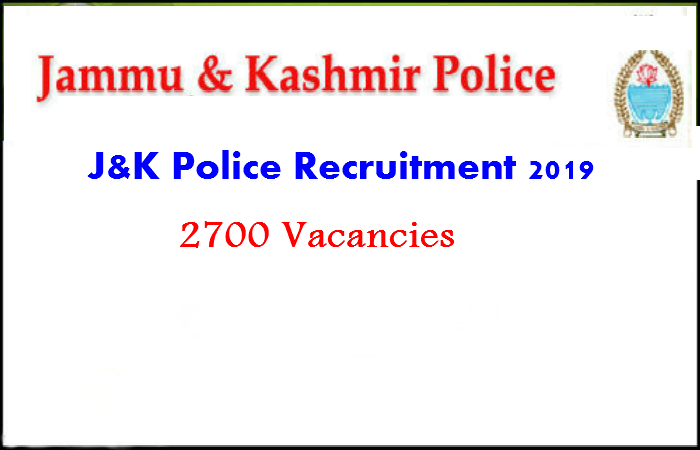 These Days, its raining Government Jobs in J&K and not is some departments, but almost all the Departments and In this context, there is Latest announcement of vacancies in the J&K Police Department for 2700 Constable Posts. The Best Part about this J&K Police Recruitment 2019 is that it has Equal No. of vacancies both for Men and Women ie 50% of Posts (1350 vacancies) are reserved for Women only. For Border Battalions, Posts are Equally Distributed among 10 Border Districts of J&K . For Women Battalions, Posts are exclusively for Females only and vacancies are Distributed among Border as well a Non-Border Districts. Moreover, this J&K Police Recruitment 2019 will be governed by the Rules of SRO 202 of 2015 (New Recruitment Policy),which means you will get only Basic Salary for First Five Years and there will be Probation Period of 5 years. In this post, we will discuss the complete Details of J&K Police Constable Recruitment 2019. Applicants who are willing to apply for these posts in J&K Police, should submit their applications through online mode with in 30 Days from Advertisement of Official Notification. Today, we have Good as well as Bad News for your. First We will share the Bad News ie Election 2019 Dates have been announced and Model Code is Conduct (MCC) is Implemented, which means, there won't be any Announcement / Advertisement of Govt Jobs for Next 2 Months. ie (From 11th March to 23rd May, 2019). So, there will be BAN on announcement of Fresh Recruitments till the elections are Over. And The Good news is that, J&K Government has approved for creation of 4000+ Posts in the School Education Department,which includes Posts of Teacher, 10+2 Lecturers, JR. Assistants, Accounts Assistants and several other posts.. This is after Dec, 2017, that J&K Govt has approved that much posts in the School Education Departments. Now your Next Question will be ? When these posts will be announced. For that you need to wait, as I have said that there will be No Advertisement of Recruitment Notifications for the Next 2 months. So we can expect announcement of Vacancies from June, 2019 Onwards. In this posts we will discuss the Complete Details of various posts that have been approved by the School Education Department. Applicants willing to apply for these post, should read this Detailed Article as When and How to apply for these posts. 4000+ Posts Approved in School Education Department. Looking for District Wise Accounts Assistant Posts?With 180 Posts, Baramulla is at Top and With 09 Posts, Srinagar is at Bottom. If you are reading this post, then chances are that you already know the News regarding the Creation of 2000 Accounts Assistant Posts for 22 Districts of J&K in Panchayati Raj Department. Since the News came out, we are continuously updating our Website for more and more Information. In our previous posts, we have shared a Detailed article on Changes in Eligibility Criteria for Accounts Assistants. This was an Important News, as for the First time, Govt has made some Big changes in the appointment of Accounts Assistants. Earlier, Graduates in any discipline were eligible to apply for Accounts Assistants and Now, Graduates in Commerce, Business Administration and those having studied Maths, Economics and Statistics at Degree Level are only eligible to apply. Well this Change in Eligibility Criteria will reduce the competition, as various Graduates from other Disciplines will become ineligible to apply for these posts. Moreover the Department has also fixed 50% minimum marks in Degree, which will also reduce the No. of candidates applying for these posts. In this article, we will discuss regarding the District Wise No. of vacancies. As per the announcement, There is One Vacancy for Every Two or Three Panchayats (Depending upon the Population) and as such, only those districts, who have highest No. of Panchayats will get greater share of vacancies. 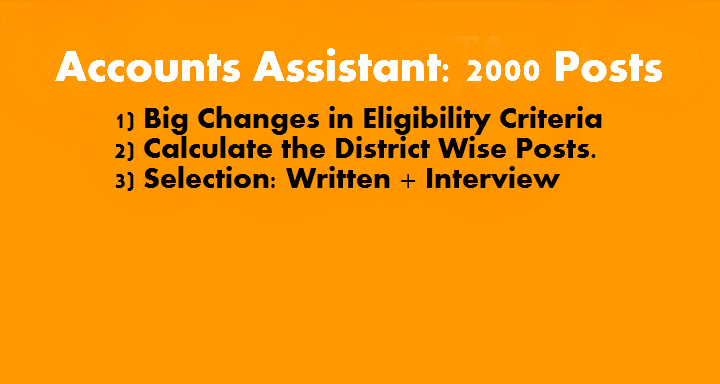 District Wise Break up of 2000 Accounts Assistant Posts. Looking for Teaching Jobs in Education Department of J&K? Apply Now for 853 10+2 Lecturer Posts in Higher Secondary Schools of J&K. As, these are Academic Arrangement posts, and as such the nature of these posts is Contractual and Not permanent. For Permanent 10+2 Lecture posts, JKPSC will soon announce the Notification. 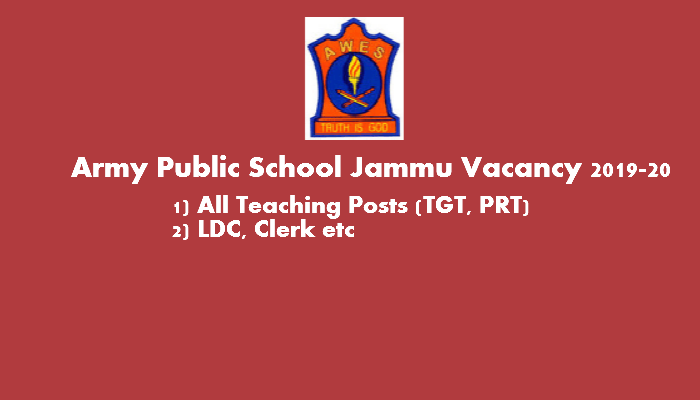 If, you are the one, who have not applied for 10+2 Lecturer posts by JKPSC announced few years back, then you should apply for these Contractual posts by Director School Education Jammu. But these posts come with some Terms and Conditions as given below. JKSSB 2000 Accounts Assistant. Big Changes made is the Eligibility Criteria. If you reading this post, then chances are that you have Heard the News regarding the approval of 2000 Accounts Assistant posts by SAC for Panchayati Raj Department. Yes, the News is True and One of the Best Employment News of 2019, as it for the first time, that a Single Department is hiring so many posts of Accounts Assistants but there is a reason for this. Owing the successful conduct of Panchayat Elections in J&K, Funde in Crores will be given to these Panchayats for Developmental Works, and Here these Accounts Assistants, will have their Job to keep a check on Expenditure. Since the News of 2000 Accounts Assistant Posts is announced, Social Media Platforms are Viral and Everyone is searching the Internet for more Information on these posts. But No one is getting credible information. So, In post we will share some detailed Information regarding the District wise No. of posts, Eligibility criteria and Syllabus for these posts. Well 2019, has begin on a Good note for Job Seekers, as JKSSB Recruitment 2019 has generated more than 1800+ Govt. Jobs and out of these the One JKSSB Advt, that is getting the most attention is JKSSB Jr. Assistant Recruitment for 157 Posts in General Administration Department. District wise Break up of Accounts Assistant Posts. If you are from Jammu and Kashmir, then you might be aware of the Term "Durbar Move" and If you don't know about it, then here is Brief Introduction for you. Durbar Move refers to moving of Offices in Civil Secretariat from Jammu to Srinagar and vice-versa. This moving of Offices, happens every Six Months. For Summers (May to Oct), Offices are shifted to Srinagar and During winters offices shifted to Jammu and This is the only reason, we have Twin capitals for J&K ie Summer Capital Srinagar and Winter Capital Jammu. And the Department which Looks After Everything in Civil Secretariat is the General Administration Department (GAD). GAD is the nerve center of administration in Jammu and Kashmir. All the Major Departments Heads and Secretaries of various Ministries, have their offices in GAD. 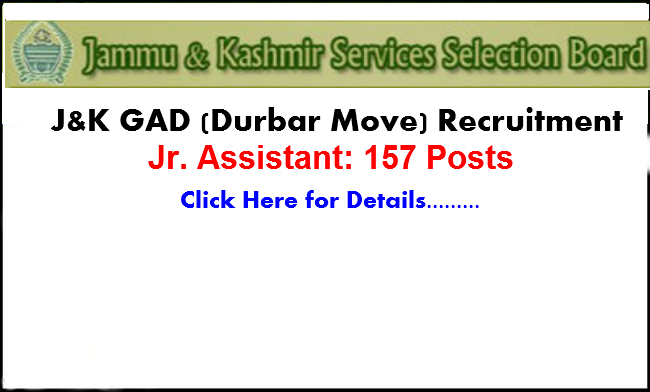 and If you are looking for Jobs in Durbar Move Office OR GAD, then this post needs your special attention as here we will discuss about the awesome opportunity to work in One of the Most sought after Government Departments in J&K. Jobs in GAD, comes with Six Months Posting in Jammu and Six months in Srinagar. Yes, in Summer months, you can Enjoy the Beauty of Kashmir and During Harsh Winter time, you can Explore Jammu. So, all in all an awesome Employment opportunity and It is not very often that GAD announces the Recruitment for Jr. Assistants. So, go and grab the opportunity and Apply for 157 Jr Assistant Posts in J&K's General Administration Department. What a Day 1st March, 2019 Is? The New JKSSB Chairman Mr. Rahul Sharma in the Office and On the First Day, there is a Fresh Advertisement for 771 Government Posts in various Departments including the General Administration Department. Yes, you heard Right, JKSSB has announced the Recruitment Notification for 771 Fresh Posts in various Departments including the GAD and the Big news is that these posts are for Graduates. So, after a Dry spell of nearly y One year, JKSSB had started releasing Job Advertisements. 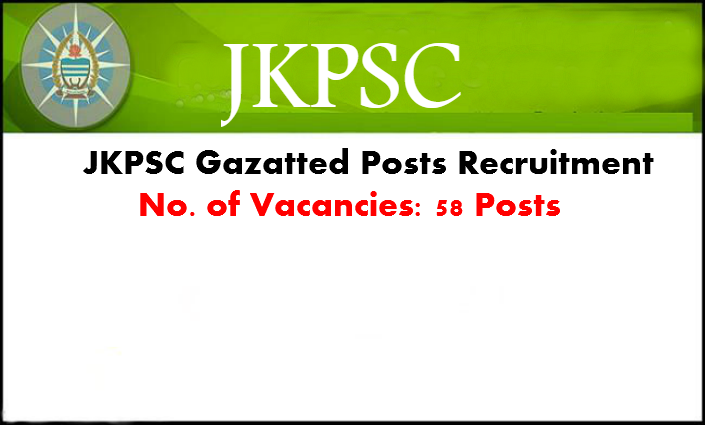 More than 1900+ Posts have been announced with in 30 Days and more will come in the coming Days, as there is a huge shortage of Manpower in Govt Departments of J&K mostly in Non-Gazetted cadre. Now, Let's Talk about the JKSSB Recruitment March, 2019. 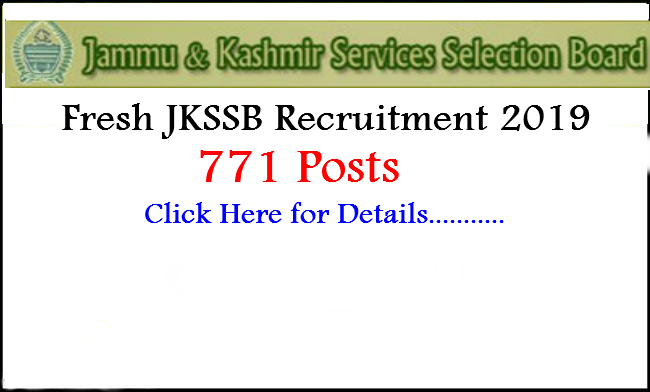 A Total of 771 various posts have been announced in the JKSSB Recruitment 2019. Applicants willing to apply for these posts by JKSSB should read this post till the end and apply online before the closing date.